Start browsing Purplemath's free resources below! Practial Algebra Lessons: Purplemath's algebra lessons are informal in their tone, and are written with the struggling student in mind. Don't worry about overly-professorial or confusing language! These math lessons emphasize the practicalities rather than the technicalities, demonstrating dependably helpful techniques, warning of likely "trick" test questions, and pointing out common student mistakes. Need a custom math course? These free lessons are cross-referenced to help you find related material, and the "Search" box on every page is available to help you find whatever math content you're looking for. Before going to class, some students have found it helpful to print out Purplemath's math lesson for that day's topic. Purplemath's pages print out neatly and clearly. You can take notes in the margins or on the flip-side of each sheet. Then, after class, return here for the next topic. Let Purplemath help you always be prepared! Homework Guidelines: English teachers tell their students explicitly how to format their papers: what fonts, what page margins, what style guides, etc. Math teachers, on the other hand, frequently just complain amongst themselves in the faculty lounge about how messy their students' work is. Meanwhile, their students wonder why they've lost points on homework and tests. Neat homework can aid your comprehension and might make your teacher like you better. Purplemath's "Homework Guidelines for Mathematics" will give you a leg up, explaining in clear terms what your math teacher is looking for. The Guidelines link to examples of common errors, and demonstrate techniques that your instructors will love! In addition, students who get in the habit of explaining themselves clearly in their homework gain greater understanding of what they're doing, and therefore tend to do much better on their tests. Don't leave easy points on the table! Study these Guidelines, print out this "formatting" PDF, and improve your learning, retention, and test scores! Study Skills Self-Survey: Many students, from time to time, wonder, "Do I have what it takes to succeed in math?" Much of one's success or failure in algebra can be laid at the feet of one's study habits. Do you have good math study habits? Take this survey and find out. Go to the study-skills self-survey! Personalized Help ($): Investigate hiring a qualified tutor in your local area (US only), or try e-mail tutoring from Purplemath's author. 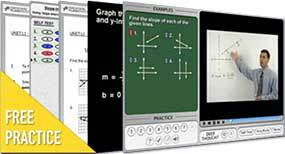 But for in-depth, quality, video-supported, at-home help, including self-testing and immediate feedback, try MathHelp.com. MathHelp.com comes highly recommended by homeschoolers, military service members, and other practical people. If you're needing more intensive help, give MathHelp.com a try!